I actually want to see a conclusion to the Bayverse. Yes, that universe is very damaged,but not unfixable. It still has a lot of potential, IMO. If better people would work at it, it could get up there with TF Prime and G1. YES! This is the greatest news ever! I don't think you understood what I was saying. I said, and you quoted, that if better people would work on it, Bv will get up there. As I said, I find it fixeable. In fact, most of the averege TF fans may be able to stabilise the first movie in a coherent timeline in raport with the other movies. I actually want to see a conclusion to the Bayverse. I've seen people throw out the idea of a short run IDW comic that concludes the films with what could be considered a TF6 plot. I'm certainly not opposed. AoE was moving things in the right direction despite its flaws and then TLK just sunk that already sinking ship. Because of that, I'm not particularly upset we won't see a TF6 in theaters, but some form of conclusion would be appreciated. You don't just leave UNICRON as a cliffhanger at the end of your film and never follow up with that. If better people would work at it, it could get up there with TF Prime and G1. And that's the problem. You would need better people working on it from the start to fix major issues (continuity and robot personalities being one). TF2007 is a fine jumping off point despite some of it's Bayisms, but ROTF would need a major overhaul, and DOTM would need a few tweaks here and there. AoE I always will argue just needs to be edited down to make the running time better and fix some character things (Shane is literally two different characters, he can't really be the jerky boyfriend in the Romeo/Juliet scene and be screaming while on Lockdown's ship) but then we get to TLK and that needs even more work than ROTF (especially since the two movies are essentially the same). If you were to rewrite time, make a comic series rewriting all of the films, or just do fan scripts to patch things up, they sorta stop being the Bay films. How many plot things would most people change? Things like robot heaven in ROTF can be removed fine and dandy, but how many people would remove, say, The Fallen from ROTF completely. Most people would rewrite all of it to the point it wouldn't be identifiable as the starting source anymore and would just be a new TF continuity. It'd probably be better, but it wouldn't be the Bay films anymore. The flaws are ironically what make the Bay films the Bay films. This is why I love the mods! The movies don't even share their own continuity anyway! If i would be to fix the Bayverse, I would separate the whole universe in three eras. The first one would be the original trilogy, with TF2007, RotF and DotM. This era would be, just like you said, mostly easy to fix. One single movie could easily correct the mistakes of the first and third movie, and maybe another one explaining some of the things from the second movie. Here I would also add prequels for all of the movies, to worldbuild and expand some characters. I would also keep Q as a separate character than Wheeljack. I actually liked him. The second era would be the "OK guys, bring the heavy movie-writing" era, containing AoE and TLK. Here is where the most work have to be done. Prequels, sequels, and stand-alone movies would need to be made to correct and expand the everything that was even mentioned in this two movies. IDW comic serieses would also be welcomed. And the third era would be the Rebirth, in which I would basically make a ten year time skip, set everything on Cybertron, and trying to move as far of Bay's original visions as possible. Prequels, sequels, and stand-alone movies would need to be made to correct and expand the everything that was even mentioned in this two movies. move as far of Bay's original visions as possible. Exactly as I said. With all the heavy lifting being done here, you're not "fixing" the Bayverse, you would be up and creating a new continuity. Sure, there's overlap, but too many things will be changed. Taking ideas from the Bay films and meshing them with others from previous continuities to make something new isn't inherently bad. That's essentially what TFP did. I understand why some would want to fix the films. I've gone through hoops to make sense of the continuity myself in this very topic prior to the release of TLK, but the only thing is, with all the work that would have to be done, why bother fixing the current mess when you could start with something new? That's obviously the approach Hasbro and Paramount are moving in. It's unfortunate they've had to essentially erase ten years of movies to get back on track, but that's where we are. It's the right call, and while I certainly emphasize, at this juncture, dreaming up ways to fix the previous five films probably isn't worth anyone's time. The first franchise that got me into TF was Prime. It was my entire universe back when I was slowly loosing interest in HF and before Bionicle G2. I currently see the Alligned continuity as Bayverse younger and serious sister, and every TF fan should understand my comparising. The second franchise that I entered in contact with was the Bayverse. The first two movies to be exact. I don't know if DotM was released yet, but it was definetely new enough to not be broadcasted here. Those two movies completely blew me away I actually initially thought that they were live action remakes of the Prime cartoon. I could easily past every dirty joke or writing inconsistency, and the Bee pee scene actually crack a laugh from my younger self (because... You know... At that age the pee jokes are the funiest things you can think of). I lost interest into TF shortly after RiD got introduced. I don't think that it was because the sequel was not living to the original, but because of personal life and Bionicle G2 (that was my Bionicle Golden Age. I have almost half of all G2 figures before of it). One day I saw AoE whilw bwing in Austria. I tried to trick myself that I was liking it for almost a year, till I saw DotM, which was almost as good as TF07. Then the last Knight came and, once again, I was triking myself that I liked it. However, at that time I was just realising that there is a TF community here on the TTV MB. Less than a year ago I was OK with the idea that the Bayverse is one of the worst TF continuity families. So as you can see, I had quite a history with the Bayverse. This is why my heart hurts when it sees it dieing in the black abyss where continuities as the Beast Era or the Unicron Trilogy died. But even those got a peoper ending. The Bayverse is a huge hotspot of nostalgia, one that I can't deny, even if I would want to. In the recent months I realised that I have somewhat of a talent in writing. This, as a result made me ask the question: "What would I do if the CEO of Comcast would ask me to wrap up this universe in a profiteable way". I just told you my plan just one reply higher. Now, would I go as far as turning it into a brand new continuity, with hundreds of new movies and sequels and prequels after the defeat of Unicron? Now that I think of, no. Do I want Hasbro to keep working at this universe and to use it as it's money cow? No, absolutely not. The Travisverse is one of the best TF universes after only one movie. Imwould definetely want to see more of it. However I say it again: I want to see the Bayverse at least partially fixed. Maybe you're right. Maybe changing the entire basics of this universe is not the answer, but you can't tell me that two or three new and good movie would not fix it. but you can't tell me that two or three new and good movie would not fix it. Unless they were to go full Days of Future Past and literally wipe everything after TF2007 out of existence, it would be nigh impossible to after TLK. Forget a new director who would understand the characters better, the continuity is too screwed up and filled with holes to fix, which is why it was easier to straight up reboot with Bumblebee. Despite being a mess of a movie, continuity wise, ROTF doesn't create too many headaches. Saying Megatron works for this guy named the Fallen, while annoying to many, is an easy retcon, and having the seekers on Earth prior to everything that went down isn't too big of an ask either. DOTM, while a better film overall, is where things get a little trickier. Megatron says that he and Sentinel were going to rendezvous on Earth to (presumably) retrieve the All Spark and use it to rebuild Cybertron. But was this a decision Megs made on his own, or by the Fallen's decree? And they knew of the Matrix, how? Did the Fallen tell them about it? Did Sentinel know the Fallen? This is really the biggest problem of the first three, or the Witwicky Trilogy. Because with the mass legion of Decepticons being hidden on the moon begs the question, why didn't they fly down in 2007 or 2009 and help out? Imagine the battle in Mission City, the Autobots are winning, and Megatron calls in the moon troops. Autobots get creamed because surprise attack, Earth is dead, Decepticons win. Age of Extinction then raises interesting questions that aren't answered, leaving open plot threads for a fantastic sequel we never got. 'The Creators' Lockdown mentions. Who are they? Are they the Quintessons? Who are the knights that Optimus was supposedly a part of? These are questions that add to the world instead of making it more confusing. Then we get The Last Knight, and the answers make things more confusing. I can honestly buy the King Arthur stuff, that's an interesting twist with Merlin being a charlatan. The rest of it? Nope. This takes the realistic idea of the Seekers being on Earth in the early to mid 1900s and blows it up to prosperous levels. Because I guess ancient Autobots helped Harriet Tubman and the underground railroad and Ironhide fought in the American Revolutionary War? I don't have much of a problem with Bee in WWII, but the plot threads left over from AoE is what really bugs me. Apparently, Lockdown wasn't hired by 'The Creators' but by 'The Creator' even though he mentions multiples every chance he gets, unless he's just really bad at grammar. And while he claimed to have captured all the Knights, he didn't because what about those that were guarding Merlin's staff? The Dinobots can't be a part of that same group because they aren't necessary for forming Dragonstorm, so where do they fit in? Also, Prime can't be one of the Knights Lockdown wanted to capture, because Quintessa had to tell him about the Knights of Iacon like it were a bedtime story. Also, when did they betray Quintessa and leave? When they're talking with Merlin in the Dark Ages, they mentioned their world was destroyed, so the Autobot and Decepticon war had been going on for some time. What did Quintessa even do to make them betray her? They just say she's the "great deceiver". Um, ok. It's honestly embarrassing to scroll waaaay up and see my 2017 self try and defend the film. Granted, there are things I still like about it, but any cool ideas put forth by AoE for where the next film could go were squandered in TLK. Lockdown's motivations don't make sense in retrospect now, the Knights as a group seems confusing because Dinobots, who were those guys at the beginning with the fleshy hand(s)? Where did the Seed go? Did Optimus chuck it into the Sun to get rid of it? By providing answers, TLK actually raises more questions and breaks what little sense of continuity the films had that were already being held together by patchwork theories from the fans and floated between sensical and bad fanfiction. I don't see how just making a couple good movies could fix that mess of a continuity unless they were to be wiped completely, and then we'd be in a similar situation with the X-Men. It's honestly embarrassing to scroll waaaay up and see my 2017 self try and defend the film. On the topic of Unicron Cybertron was destroyed during the war, as per almost every Transformers anything, and further damaged by going through the space bridge in Dark of the Moon. It can be assumed that Quintessa figured that she could use what was left of Unicron's energy to siphon Cybertron back to life and finish him off once and for all. Unicron wasn't meant for that purpose, but how else are you going to fix a former planet-former (assuming Primus is Cybertron, which, given Unicron's involvement, he most likely is)? the continuity is too screwed up and filled with holes to fix, which is why it was easier to straight up reboot with Bumblebee. I never really understood why everybody says that the continuity is that screwed. Can you give me an example? Megatron says that he and Sentinel were going to rendezvous on Earth to (presumably) retrieve the All Spark and use it to rebuild Cybertron. But was this a decision Megs made on his own, or by the Fallen's decree? And they knew of the Matrix, how? Did the Fallen tell them about it? Did Sentinel know the Fallen? I would say this: Sentinel is one of the original Primes, right? Or at least one that followed after the first generation, the ones that sacrificed to defeat the Fallen. How about Sentinel would be corrupted by the Fallen into becoming his second in command, along with Megatron? He would be an undercover spy at the end of the Autobot-Decepticon war on the Autobot side. However, he could not get to do much because The Fallen sent him and Megatron on Earth to retrieve the AllSpark and the Matrix so that he could rebuild Cybertron and conquer the universe. Hey, I like the name! Because with the mass legion of Decepticons being hidden on the moon begs the question, why didn't they fly down in 2007 or 2009 and help out? Because for most of that time Megatron was either dead or in critical condition. Who are they? Are they the Quintessons? Apparently, if you consider Quintessa a Quintesson. Who are the knights that Optimus was supposedly a part of? The ones from TLK that we should have get to know more about because they were the main focus of the movie. Hell! We barely got any figure of them! I can honestly buy the King Arthur stuff, that's an interesting twist with Merlin being a charlatan. Me too. I don't understand why people don't like it. Apparently, Lockdown wasn't hired by 'The Creators' but by 'The Creator' even though he mentions multiples every chance he gets, unless he's just really bad at grammar. Or maybe meanwhile the others either died or dissipated, leaving only Quintessa. And while he claimed to have captured all the Knights, he didn't because what about those that were guarding Merlin's staff? Weren't they hidden in a spot where Lockdown could not get to? The Dinobots can't be a part of that same group because they aren't necessary for forming Dragonstorm, so where do they fit in? Who says you have to be part of Dragonstorm to be a Knight? who were those guys at the beginning with the fleshy hand(s)? Who says that Quintessa isn't a Techno-Organic? Under her armour she may have one of those hands. Where did the Seed go? I think Cade or the Autobots hid it. Did Optimus chuck it into the Sun to get rid of it? No, because right after the end of AoE to the beginning of TLK he was looking for Quintessa. Two movies would at least solidify the Witwicky Trilogy. And yes, we can Days of Future Past the last two movies. No, because that's pretty much literally what happens. I'll stand by it. DOTM makes it pretty clear he despises Megatron and the 'Cons. The only reason he ends up working with them is to rebuild their home. I'm sure there would be double crosses had he succeeded, so that doesn't pass muster. Another great reason for Starscream or whoever passed for a commander to call in reinforcements and exact fiery vengeance. Not, because she calls herself the "Prime of Life", leading to the logical insinuation that she's an ancient Cybertronian, and one of the original 13 (which tie-in material also confirms). Which makes less sense given ROTF's story. Thanks for bringing that up, forgot all about it. Ok, so if Optimus was a part of that group... then how did he not know of Quintessa prior to meeting her at the start of the film, and why wasn't he with them guarding Merlin's staff? If he WERE then why isn't he a part of Dragonstorm? He shouldn't even have ever been in a position to lead the Autobots if he was. Yes. So why did he then claim to have all of them? If I claim to have all the cookies yet there are some on the top shelf that I cannot reach, then I do not actually have all the cookies. The film at the very least hints that this is the case by mentioning only twelve guardian knights and showing them all forming Dragonstorm at several points in the film. Also, TLK states that there's only twelve, so what are the four Dinobots, then? This is an interesting idea, but given that there's a LOT of those ships at the beginning of AoE, I'm more inclined to think that it's entirely all organic beings piloting the ships. 1:39 "I shall take this seed where it can never be found." Given that we see Frosty Prime around Jupiter or Saturn at the beginning of TLK, he didn't go far before freezing, so what, did he just drop the seed on Mars, cover it with some dirt, and continue on? It is logical to assume we're seeing him AFTER he got rid of it (or else he brings a thermonuclear bomb back to Earth after promising to get rid of it) so the fact he's not even out of Earth's solar system raises the question of where he hid it. Take that thing from as far as Earth as possible! Two movies would at least solidify the Witwicky Trilogy. As in make two new movies that encompass the events of all three, or two new movies that exist just to clarify and retcon the events of the trilogy? Because if it's the second option, that's some faulty logic that says what state the continuity is in if you need to make two movies to explain what happened in three previous ones. "Face it, Sentinel! The only way to rebuild Cybertron, to save your home, your planet, your friends and allies, your paradise, is to join me!" Maybe he didn't know about Sentinel. Then... She is this universe Quintus Prime! then how did he not know of Quintessa prior to meeting her at the start of the film, and why wasn't he with them guarding Merlin's staff? Maybe he left the knights before they started doing business with Quintessa? So why did he then claim to have all of them? Because he's Lockdown. He's a bounty hunter. Would you go to your client and tell him "Yeah, I killed every knight, minus... like... a lot of them."? Also, TLK states that there's only twelve, so what are the four Dinobots, then? there's a LOT of those ships at the beginning of AoE, I'm more inclined to think that it's entirely all organic beings piloting the ships. Don't see why this would be an argument. What if ALL of them were Techno-Organics? What if he had it the whole time but he just... didn't showed it up? or two new movies that exist just to clarify and retcon the events of the trilogy? This, adding some actual story that would clarify everything. Because if it's the second option, that's some faulty logic that says what state the continuity is in if you need to make two movies to explain what happened in three previous ones. I don't think you got me... I mean two movies, with their own stories, characters, etc (so it would not be obvious that they are only trivias) that would contain possible explanation for different continuity errors. Where were the Autobots between the two movies? Why did the Autobots killed that Constructicon and Sideways at the beginning of RotF with no actual reason? Where did the Constructicons came from? How did Starscream met the fallen? Boom! Movie to explains everything. Dang, Prentice! Didn't knew you are such a TF geek. Quintessa mentions it during her "here's my evil bedtime story" to Optimus. 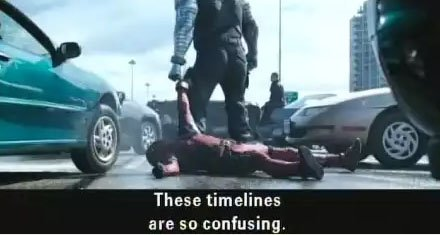 I mean two movies, with their own stories, characters, etc (so it would not be obvious that they are only trivias) that would contain possible explanation for different continuity errors. Again, if you need a whole movie(s) to fix your continuity issues (which is what TLK was supposed to be) then you've got a problem. Even with sticking to the things you listed and nothing else, how does that flow as a movie? It doesn't really. That's what was kind of the great thing of the IDW movie prequel comics before Bay decanonized them. Added to the characters and set up the backstories well. Oh yes. TF2007 was a fantastic intro into the franchise and then Transformers: Animated further solidified my love of the brand. I don't want to have given up on the Bayverse. Despite it's flaws, I still love movies 1-4. I adore Age of Extinction and it still remains my favorite film in the franchise (and this includes Bumblebee). I wouldn't have this shelf if I didn't love the films, but TLK just screwed everything up past the point of saving. I mean he didn't wanted to return to Earth in the first place. He returned when he was Nemesis Prime. Even with sticking to the things you listed and nothing else, how does that flow as a movie? It doesn't really. If you want I can PM you a possible script for a movie who's main hidden goal is to hide all of the ones I listed, but you need to give me some time. You should join a Transformers rp at some point. I mean... If mods are allowed and have the time to play in rps. Considering how much of a psycho movie prime is I wouldn't be surprised if that was the case. He wasn't brainwashed in TLK; that was just the natural character progression from somewhat violent to actually being evil. Man... I am actually going to do that. I mean... It sounds like a fun project.